In the first post in the Customizing the RD Web Access 2012 R2 interface series I added a section that describes how to remove the Domain prefix in the login.aspx page. Initially my customization only functioned for Domain joined machines, so the post required an update. The updated customization fixed the initial problem: non Domain joined machines accessing the RD Web Access pages can now successfully log on using their username only, without prefixing it with the Domain Netbios name. It turns out that this page uses different code to change the password, and this code requires a Domain prefix, or UPN. I decided not to post another update, but instead dedicate a full post to this issue, and the solution to it. If you now look at the original post you’ll see that I refer to this post when this customization is discussed. So here goes, a full solution to properly remove the Domain Prefix requirement from the RD Web Access pages. As always, backup the files in %windir%\Web\RDWeb\Pages, just in case..
I’m using the same environment I used in the original post, so for more info on that read that post. As you can see, the interface by default expects the user to enter the username in the NT Account format, e.g. Domain\user name. If you publish the Web Access interface for a single domain infrastructure or if you want to define a default domain to logon to, you might want to consider to let the user just enter the username instead of the NT Account. Besides, even if it would, it still shows “Domain\user name:” on the label. So we need to fix two things: the text on the label, and some code to accept just the username. This line holds the text for the label. Or replace “User name:” with a custom text you prefer. This changed the label text to just ask for a username, and not to enter a domain prefix. This line tells the rest of the code that by default there’s no domain available and it needs to be extracted from whatever the user entered in the fields in the login page. And of course replace “ITW” in this example with your own NETBIOS name for the domain. Replace “ITW” with your own NETBIOS domain name. Now save this file as well. If you decided to allow users to change their password, the user can click a link to open the password.aspx page when they log on, or when the pages detect the password has expired. If you want to remove the Domain Prefix from the RD Web Access interface, you need to do some more editing. This line, again, holds the text for the label. Again, replace “ITW” with your own NETBIOS domain name. Really really dirty, but gets the job done. The password.aspx file is only meant to be accessed if the user is already authenticated. The password.aspx file is not meant to be used to allow users to change their password without being authenticated first. Examples of this include adding a link on the login.aspx page to password.aspx, or simply using the aspx files to allow domain users to just change their password, not using the RD Web Access at all. If you do want to add a link to password.aspx to allow password change, I suggest you add a link on the toolbar. I describe how to do that in the Customization series. This added “ITW” as the default authentication domain in both the login page as the password change page. Nothing changed in the rest of the code, so if your Web Access is intended for multiple domains, the user can still enter “CHILDDOMAIN\user name” or “TRUSTEDDOMAIN\user name” or even “ITW\user name” if the user wanted to do that. We’ve also not destroyed the possibility to logon using UPN instead of NT Account logon. These changes are instant, there’s no need to restart IIS. Just (re)load the Web Access page and test the changes. Unfortunately, with this customization you need to enter the NETBIOS name hardcoded in three different files. In a future post, which will cover a full customization package with application settings in IIS I will show how to eliminate this and make Domain NETBIOS name an application setting which works across the complete RD Web Access interface. i have a question. I set up a 2012R2 RD Farm and now i will customize the WebAccess. All Servers are inside our domain also the RD Gateway. Everything works well inside the company network, also Single-Sign-On. Form the outside starting applications is fine, too. Is it possible to remove the whole dialog? Or at least specify the deault domain name? Ive found a posting on the net to modify the BtnConnect () in Desktops.aspx, but it dont work. I think its totally crap to remove the domain name from the whole WebAccess – but at this Point the user has to know and type the domain name! If the ‘external’ computer is a member of the domain – AND you are using a PKI infrastructure. 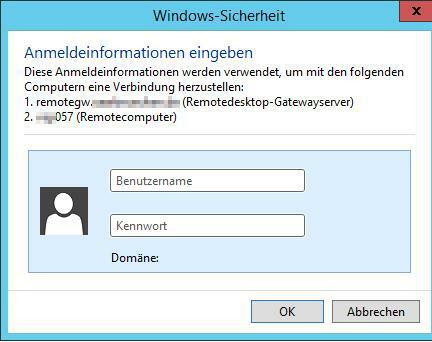 Then the PC you are creating an RDP session to (using: connect to remote pc), will need a PKI assigned RDS certificate. In addition to that, you will need to approve the thumbprint of the RD Service on both the gateway and the redirected desktop as trusted for single-sign on. Hope that is enough to guide you in the right direction. NOTE: If you copy and paste this, make sure the double quotes come across OK and aren’t invalid smart quotes. Dosen’t really seem to work for me..
Can i skip everything in this article and ONLY do this little thing ? Cause i’ve tried everything now it feels like. or should i just pase it underneath this line ? And the “Renderscripts.js” dosen’t need any of the configurations that is mentioned in this article or ?? Don’t replace any lines, just add it before Line 42 like I mentioned. And yes this all you need to do. But thank you for pointing that out tho. I tried again to add theese couple of lines before line 42, and it kept saying “You must enter a valid domain name. So i tried a couple of things.. “MYDOMAIN” has to be the NETBIos name (like mentioned in this article) but i tried with NETBIOSNAME.com, netbiosname and NETBIOSNAME but neither of em worked.. This morning however the behaviour I’m seeing is that I can log into the RDweb page successfully however when I click on the Remote Desktop session collection I get an Authentication box pre-populated with the username and prompting me for password. I was able to repliacte this behaviour with several different user accounts. I needed to click “More Choices” then “Use a Different Account” and manually specify DOMAIN\Username and it logged me in successfully. Then I signed out and closed Internet Explorer and tried again but this time after clicking the Remote Desktop session collection it took me straight through to the desktop, I was then able to replicate with different users and they all worked. I’m doing this on Server 2016 and I’m only adding the content below to my web scripts file and it’s not working. Can someone please review and let me know what I’m doing wrong please? I would greatly appreciate it. This works great! BUT now all my published applications are giving a double authentication in order to launch. When i rever the to the original files, this does not happen. Hi John, double auth prompts are relatively normal. The RDS Gateway is the first, and then the RDS Broker is the second. If your gateway is under the public DNS record ‘RDS.company.com’ then make sure internally, your internal DNS resolves ‘RDS.company.com’ as the broker IP address. This will reduce auth prompts internally within your network to just 1x. I also was hit with the “Another user of your computer is currently using this connection. This user must disconnect before you can log on.” and this caused various issues depending on if the user was on Chrome or IE11. I found that it was easier to configure SSO for internal users and just have external users utilize their email address to access. Easy training, no errors. 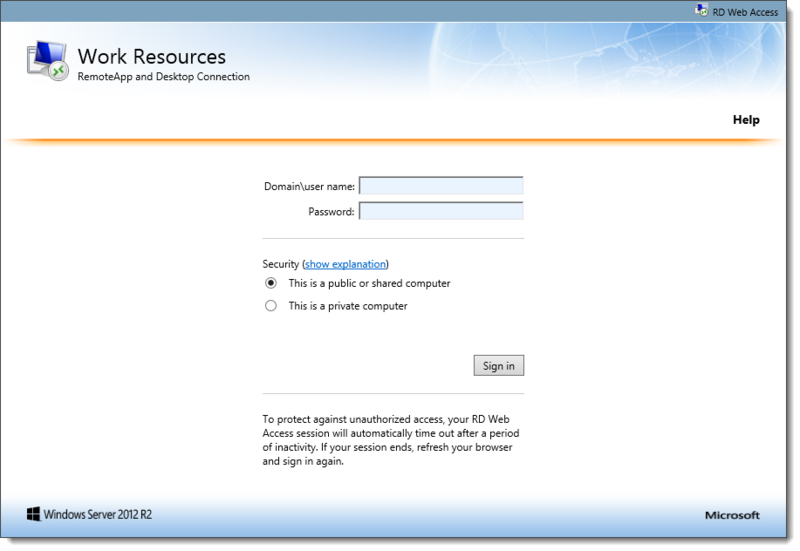 Doesn’t seem to work on 2012 R2 RDS anymore – it lets me login but unfortunately none of the apps are displayed. However, if I login using the domain\username format, the apps show up. Turns out this is working. I was hitting a unique scenario where my RDS server had a LOCAL user account that was identical (username & password) to the domain account I was trying to login as. The login was working and taking me to the apps the LOCAL user account had access to, which was none. adding the domain\username was logging in as the DOMAIN user account and was showing me the apps. Therefore, this fix is working as expected on RDS 2012 R2 and my specific scenario was unique and causing the correct but unexpected behavior. Side note: the LOCAL user was to be purged and was from the original install of Windows OS prior to joining to the domain. On the password change page, it will not let the user input an email. All we want is the password portion so we don’t want the user to log in. Is there a way to make that happen? Does anyone have a solution for the double password prompt on Server 2016? My users are able to log in fine with just the username, however they get prompted for a password again when clicking on a published app. If the user logs in with their UPN, everything works fine as it seems to carry the domain name across for the app. Does anyone know how to fix this so that users can log in with their username only without having to use the full UPN? By now MS Windows should have this implemented contexless and not require the Domain prefix at all. It work sometimes. I am happy with this article. If I go to the new link for the password change the field for user name is already empty and not editable, it’s blank and I can’t put the cursor in it. Just like to mention: I have linked the password site in the navbar next to help. Everything went fine except when I change edit the password.aspx file. I cannot enter my user name as the textbox doesn’t seem to be active (it was before). It seems that now on my password change page that the user name field is now disabled and I cannot type into it. Is there a reason we disable the ShortUserName field?= and nto leave it enables so someone can type in the name of their user? Aso if the user has to be authenticated already can you not just pre-populate this field with the authenticated user name? Yes, you can ‘direct’ people with “&username=John.smith” added to the URL. Meaning we can invite staff to reset their password over emails/SMS messages or other mechanism. I’ve used this in the past. May I ask how you can reopen the authenticate box? I still encountered the problem that user name field is disabled. Just remove the “disabled” HTML from the input field. Disabled means you can’t type in it.